The Modelling News: New book Preview - Axel Urbanke's "As a tank man in Africa and Italy 1942-45"
New book Preview - Axel Urbanke's "As a tank man in Africa and Italy 1942-45"
This book is the first volume in a series of publications that will appear under the name "Photographed by soldiers" in our publishing house. Basis of the photographic memories of individual combatants who are supplemented as needed by more or less extensive accompanying texts. This should the photos or existing letter or diary entries are placed in the overall context of the actions. Supplementary artwork is attached only very sparingly, if gaps need to be closed in order to preserve the overall context. The series is intended to allow recreate the war from the subjective perspective of individual soldiers. Volume 1 of the series is Jack Smith in the centre. 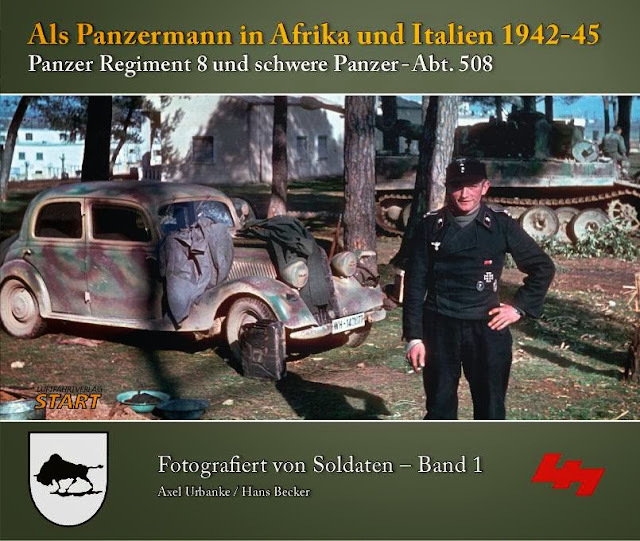 As a staff member of the Panzer Regiment 8 in Africa 1942/43, he has the local Front extensively documented photographically. He was then appointed by the commander of the heavy tank battalion 508, end of 1943, "noted to illustrate the war diary of the way the department figuratively." So Hans Becker also photographed the use of this Tiger unit in 1944/45 in Italy and not only in black / white photos but also in colour slides. Moreover, since diary entries and letters to his wife could be used for the book, an impressive documentary about the use of two armoured units from the point of view of a rod soldiers has emerged that some had insight into decisions. The photos and records Beckers were fitted with linking texts and maps to present the reader with a smooth, comprehensible storyline. That the excellent recordings of Hans Becker, whose entire passion of photography was, in this way almost 70 years after the war still found their way to the light of publicity is likely to be a godsend for all interested in history.